There’s nothing like coming home from a trip but to tell you the truth – I so want to be back on the beach right now. Rain for the next two days in the NY area? P.U. Our little excursion to Tampa was relaxing with the only blemish being a 2 hour delay on our flight home. It was fun though to hear our names being called over the airport PA though and when I say fun I mean terrifying! We had checked in early enough but the monitors just said delayed and nothing else so we figured we would wait it out by the food court. I guess those gate people had another idea – they started boarding and didn’t update the monitors to let others in the airport know… so me and the man just sat there unknowing until I heard our flight call for final boarding… I swear I haven’t jumped like that since high school. I love how calm the airlines people are when you’re hand is shaking because you were so freaked out about missing your flight only to find that you would be in the plane taxing for another 45 minutes. 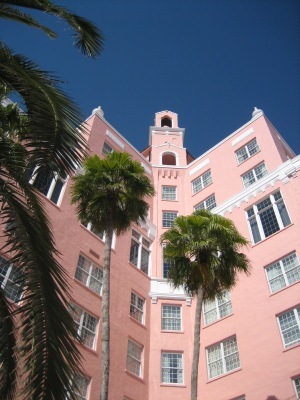 We stayed at the Pinkest Hotel on St. Pete Beach, the Don Cesar. I laughed out loud when we drove over the Bayway and saw it appear on the horizon. Overall, the room and service were excellent. We ate at their Sunsets and Sun Porch restaurants and had excellent meals. They apparently have a very popular Easter Brunch because the hotel was bumping when we arrived on Sunday. The Don did host a ton of families – and nearly every kid thought the hot tub was their own personal pool so for those adults who like the private get-away this venue isn’t exactly the spot for you. But if you don’t mind kids running around pools and splashing you from time to time from playing catch – you’re ok! 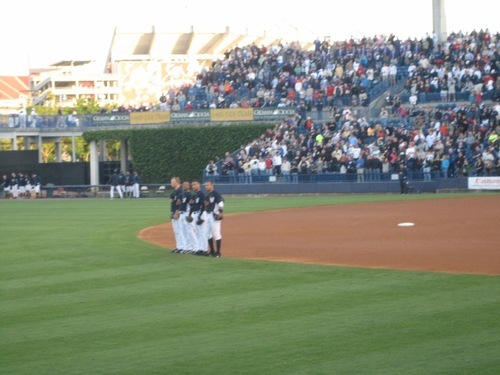 On Monday night we went to see the NY Yankees play at Legend’s Field. Our seats were on the Left Field side – 3rd row up. We were making friends with the Philly’s bullpen and had a great view of Shelly "Cleats Up" Duncan and the pretty left infielders, Jeter and Rodriguez. The hot dog wasn’t as good as the Bronx original but cheaper beer made up for it! I did get some nice knitting done, having finished the back of the Sadie cardigan and a few repeats of the Icarus shawl. I’m now almost done with the two fronts and need to figure out how much I want to shorten the sleeves by. I saw a beautiful version on Ravelry that had 3/4 sleeves which is what I think I’m going to go with. I’m not very experienced in modifying patterns but I think sleeve length is a safe place to start. I am always amazed at those knitters who can completely deconstruct a sweater and re-knit the whole thing (so easily it seems) to their delight. I am such a fool for directions. A special thanks to Tiennie who sent me two gorgeous skeins of Koigu for being her 6,000 commenter!! I think I’m getting close to my 2,000?? so I know it’s a huge milestone and I’m so excited to have been that person! Woo! Well, here’s a little something to leave you all with… we don’t get sunsets like this in Jersey – my Cali people you are so spoiled ;-). 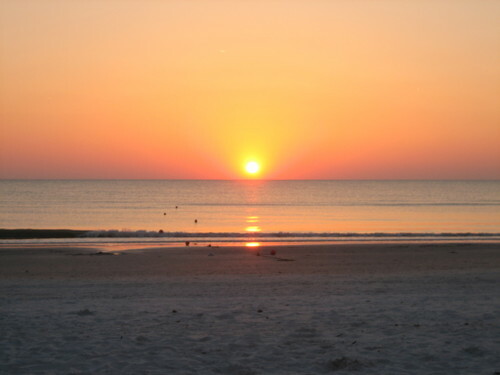 ahhh, i have a lot of memories of st pete beach and the jersey shore. glad you had a good time! how wonderful! coming home from a nice trip is the worst – especially to weather like this! oh, to be back in the sunshine. we are getting a rain/snow mix this morning. where is spring??!! That’s beautiful! I’m glad you had such a fun time in my home state! There’s nothing like our beaches anywhere else! P.S. Your tilted cardigan on the previous post turned out really cute! Being a Floridian (or a former Floridian, I should say) I get the charm that the state has to offer, especially right now with such crappy weather in the northeast, but you know, spring will actually arrive here soon (even though the calendar says it already is). Welcome back!